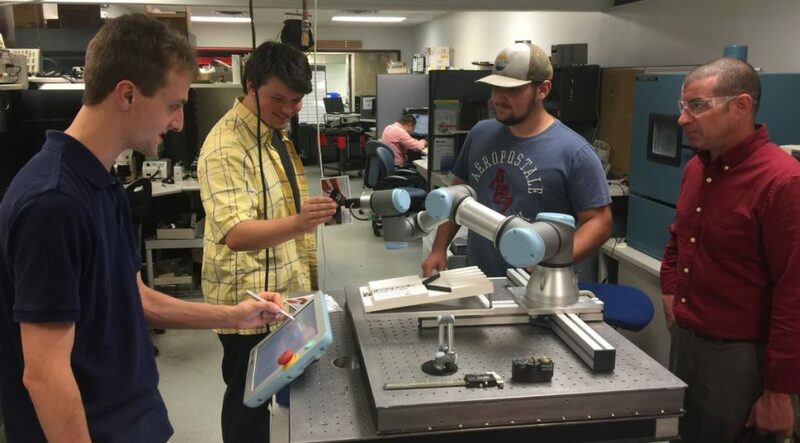 New Scale Robotics hosts students from the Finger Lakes Community College (FLCC) in New Scale’s micro-mechatronics research and development lab near Rochester, NY. Here the group is working with the Universal Robots UR3 cobot and New Scale Robotics’ NSR-PG precision parallel gripper. The class learned about the gripper’s teachable finger positions, and about programming the gripper using the UR teach pendant and a URcaps plug-in. The Instrumentation and Control Technologies program at FLCC, directed by Dr. Sam Samanta, includes courses in emerging technologies, applied physics digital electronics, automated data acquisition, and automation control. New Scale supports the program and other technical workforce development efforts with facility tours, mentoring and internship opportunities.